Standard Redco™ blue nylon kiln wheel bushings are a cost-effective and proven solution as a kiln wheel bushing. The nylon used in these bushings is heat stabilized to handle long drying periods in the kiln. 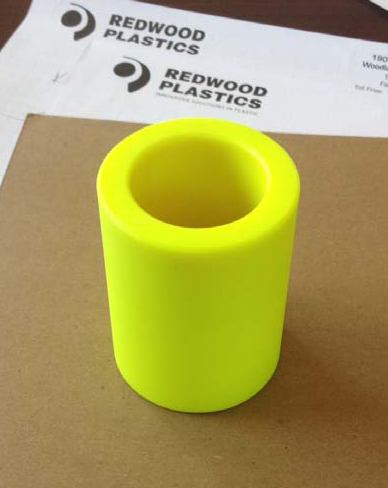 A premium kiln wheel bushing we’ve been developing on at one of our western American branches the last couple of years. The yellow bushings in testing outlast and outwore the blue nylon bushings significantly and use a proprietary material we’ve developed to replace Redco™ blue kiln wheel bushings at a modest cost premium. The yellow bushings have more than paid for themselves in increased lifespan and, yes, they make the carts run smoother as well. These bushings are a substitution for Redco blue nylon kiln wheel bushings. Phenolic kiln wheel bushings are used in high load (36,000lbs+) applications or where extreme cold is involved. Due to the properties of phenolic (a fairly high coefficient of friction), it is recommended to put a grease groove in the bushing.